In 1879 Napoleon LeBrun became the official architect of the New York City Fire Department. When son Pierre joined him the firm became N. LeBrun & Son. LeBrun would produce 42 structures for the fire department before stepping down in 1895. But he went out with a splash. In 1894 N. LeBrun & Son drew plans for a lavish new home for Engine Company 31, which had been situated at No. 116 Leonard Street. But first the architects had to deal with a logistical nightmare. The site where the new firehouse was to be built was atop a filled-in body of water called Collect Pond. 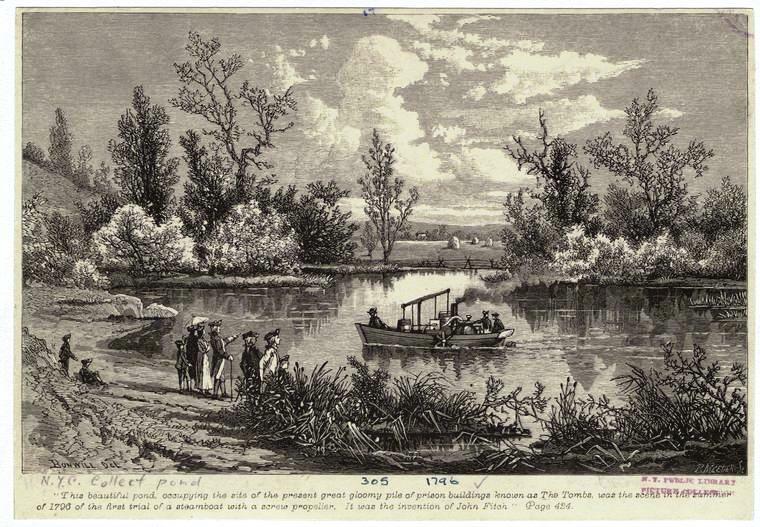 In the 18th century the pond covered 48 acres and, in spots, was up to 60 feet deep. What had been a popular place for picnics in the summer and ice skating in the winter became polluted and odorous when tanneries, slaughterhouses and other nearby business dumped their waste here. Derided at the end of the 18th century as "a very sink and common sewer," it was slowly filled. By 1813, the entire lake was undetectable. At least on the surface. Below ground the water remained. LeBrun's solution was to drive immense wooden pilings below ground on which the foundation of the firehouse would sit. He knew, as was proved in Venice, that as long as the pilings remained submerged they would remain stable. For Engine Company 31 he turned to the Loire Valley of France for inspiration. 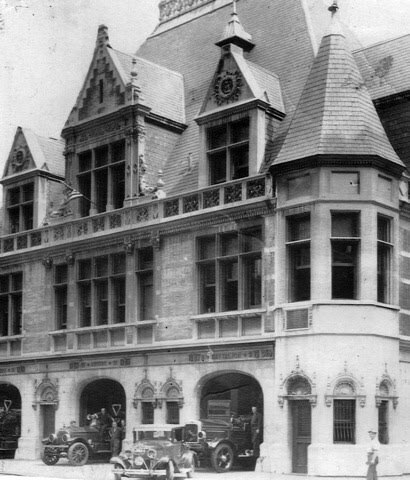 Looking more like chateau than firehouse it was completed in 1896 at a cost of $80,000--more than $2.3 million today. A mountainous slate-shingled roof erupted above two stories of limestone and brick. Bold dormers, more than a story tall, were worthy of Fountainebleau. While it was admittedly beautiful, some contemporary critics found it a bit much. In The Architectural Record, Montgomery Schuyler strongly questioned what elegance had to do "with so grimly practical business as putting out fires." And the Real Estate Record & Guide called it a "manifestly extravagant absurdity. Both detractors seemed to be foreshadowing the 20th century architectural principle of "form follows function" which resulted in firehouses being no more interesting than a suburban garage. 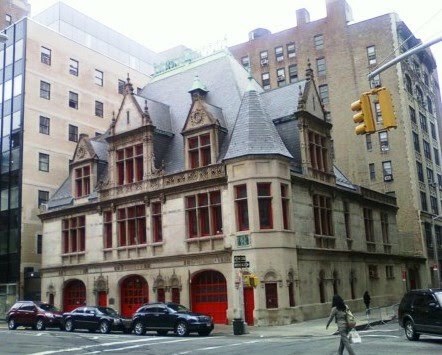 Engine Company 31 called 87 Lafayette Street home until the Fire Department abandoned it in late 1972, just ten months after it was placed on the National Register of Historic Places. It sat neglected and empty for seven years before Downtown Community Television rented space from the city there. Then, in 1983, DCTV purchased the building along with the Chinese-American Planning Council for $400,000. The new owners bought an expensive problem. Over the years the long forgotten Collect Pond had begun drying up. The water level below the street fell which caused the pilings to dry out and begin to rot. LeBrun's elegant chateau began settling unevenly as the pilings eroded. The entire foundation had to be reconstructed at a cost of almost $800,000. Additional costly restoration has taken place, bringing No. 87 Lafayette Street back to its former glory. The New York Landmarks Preservation Commission noted in 1966 "the quality of its detail and in the use of fine materials it is unsurpassed by any building in its category." Absurdly extravagant or not, I prefer LeBrun's Loire Valley chateau to a suburban garage.